depending on the shape of the device’s screen. Use WatchViewStub to inflate the view as below. how to implement voice command capability in an Android Watch application. 1) App Provided Voice Action. 2) Free form speech input. Here is the link for the example project.Have fun playing with it. Android watch is the new thing to explore for Android developers.While it is fun to develop apps with the the same UI principles of Android mobile phones,it is worth looking at googles UI recipes for watches.One of the most interesting UI patterns that I like is 2D Picker pattern.In this article I will explain the need of 2D Picker pattern and present an example project to play with. 2D Picker patterns is very nicely thought recipe for a small screens. Imagine we are developing ﬂight status watch application for our ImagineAir airlines.The objective of the application is to provide informations of all the ﬂights . 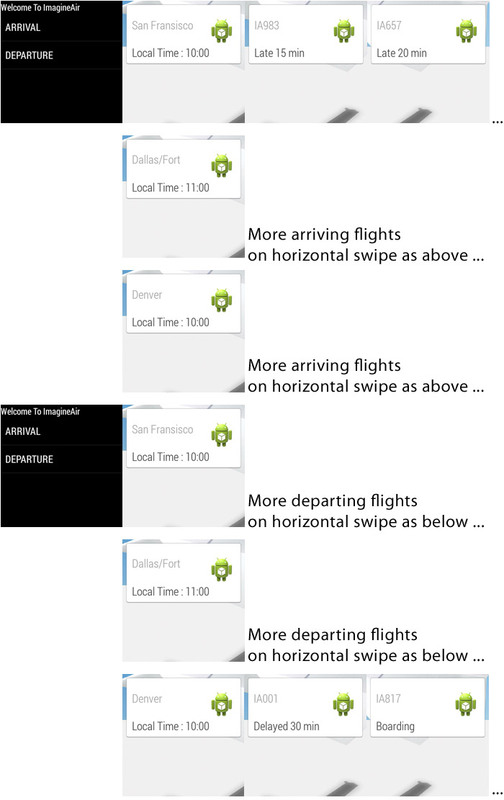 If we are developing a mobile application the design should start with a selection for cities,then present a scroll view of all the ﬂights departing and arriving the city.If the user selects a ﬂight he or she will be provided the detailed information.But if I have to do the same for a watch it will be a bad user experience . The user will be bombarded with information in a very small screen. Now lets think about the same information to be presented differently.We present very little information on demand.And that is the objective of 2D Picker pattern.So We allow the user to select whether arrival or departure information is required.Once selected let the user navigate cities by down swipe.User can swipe down to ﬁnd a new city. While in a city it can be swiped right to ﬁght the details of the ﬂight one after another right swipe .On swiping down the user can see the next city or on swiping to right the user will be presented with the ﬂight details one at a time. So the user is navigating down or right to ﬁnd deeper information as he or she needs.It is a nice experience ,less confusing and information is on demand.We need to remmeber that navigation should be vertical and then horizontal just like we write bulleted headings one below another then expand each bullet horizontally. In today’s world, kids have access to all the technology gadgets of today such as iPhone, iPad, iPod Touch and other devices. Kids spend a great amount of time playing games, browsing while using these devices. Could we use these devices while providing quality education to kids ? It’s a challenge for parents to make use of these devices in a productive way for kids. With that in mind, Sprima has developed a number of educational applications such as “KidsScience” for K-12 kids. The app is mainly divided into 2 group of questions. One for elementary kids and one for high school kids. The questions are based on various states’ syllabuses. The app generates questions and let the kid select a correct answer. It provides immediate feedback, if the answer is correct or wrong. If the answer is wrong, it provides the correct answer. The app also keeps the time taken to solve the questions. It’s a very simple app to keep kids engaged while learning social science, natural science and other artifacts of science. Feel free to provide feedback of the app to us at appleStore or info @ sprima.com . Like us at http://www.facebook.com/sprimaincsprima and send us your request for Free Promo Codes. We will will give away 10 Promo Codes. First Come, first serve. OVO provides policies, scripts and tools for self-monitoring purposes. However, if those policies, scripts or tools are deleted, those utilities could be restored quite easily. We can use opccfgupld command to upload this data. Here is how to restore the scripts, policies etc. First of all log into OVO management station. Check, if there is any certificate request is pending by running the following command. If you see any pending request, you could approve the certificate request by running the following command in management station. At this time, if you run the earlier command, ( /opt/OV/bin/ocvm –listpending –l ), you won’t see the pending Request ID for the approved certificate. Log on into your OVO Management station. To check if there is any certificate request is pending from any of the agents run the following command. It would show if any certificate request is pending or nothing is pending. One can download the configuration data by using the following command. This command will allow to select the parts of the configuration that the user wants to download. Here are the steps to find the certificates available to a local OVO client . (2) Run the following command. Run the following command on the OVO client to remove the trusted certificate.